The term "Dirigible of Doom" alone is truly enough to get my attention because I don't think dirigibles get used enough as words or as military vehicles. Is that because they seem a bit cumbersome and slow and lack a certain amount of stealth? Because those could be valid points, but I think they fail to consider the dramatic potential inherent in battling from a giant balloon. As if the trailer isn't awesome enough, this is the cover. Added up together, there's something so delightfully cheeky and pop-tastic about the whole thing that I immediately ran downstairs at work and grabbed our copy. It turns out to be pretty fantastic. 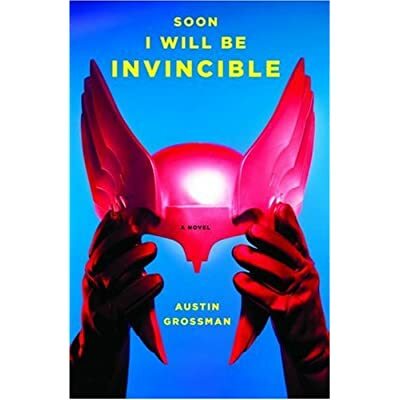 Austin Grossman has a real sense of humor to be sure, creating an evil genius who ruminates on why superheroes don't worry as much as they should about security, but is quick to note that they do have nice office chairs. More impressive, though, for me is the fact that the characters are actually fleshed out nicely. I would have been satisfied with a cheeky send up of guys in tights, but instead Grossman explored what it's like to be an evil genius, what makes one choose to be a villain instead of a hero, what kind of pride a mad scientist might take in being a man of science. Much like in Paradise Lost, it's surprisingly easy to find yourself rooting for the villain. The book is narrated from two alternating perspectives. That of Dr. Impossible, who delivers the monologue seen in the trailer and of a cyborg who has recently been added--on a trial basis--to a team of superheroes who have lost a key team member. The cyborg, who chose the name "Fatale" from a list of possible hero names (later regretting she didn't pick "Cybergirl" which is easier for people to understand and pronounce). Both of them are outsiders, giving the reader interesting perspectives on a group of people who have superhuman abilities, but around the lair, they call each other "Ellen" and "Jason." I have to say, I'm happy to have discovered the book trailer, which did a nice job of convincing me in a minute and a half to move the book to the top of my reading pile (a stack that is growing tall enough that I expect it to topple over and kill me any day now), and this week I was a few minutes late to work because I was finishing the book as I drank my morning coffee.